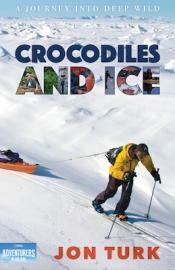 Crocodiles and Ice is a scientist/adventurer's journey into a Consciousness Revolution based on a deep, reciprocal communication with the Earth. The book highlights Jon Turk's award-winning polar expedition circumnavigating Ellesmere Island, as well as other, lesser known passages. But, more critically, Turk tells the story of his lifelong journey from suburban Connecticut into a passion for Deep Wild, an ancient passage, repeated—in one form or another—countless times, and ignored just as often. Jon invites his readers to listen to our Stone-Age ancestors, the poets of the '60s, a wolf that lingers, a Siberian shaman, a Chinese bicycle nomad, a lonely Tlingit warrior laying down to die in a storm, and the landscapes themselves. Because beyond the wondrous and seductive opulence of our oil-soaked, internet-crazed, consumer-oriented society, there lies a glorious and sustainable lifestyle that is based on Deep Wild as a foundation of solace, sanity, compassion, and hope. ~Henry Pollack, Co-winner of the Nobel Peace Prize with Al Gore, and author of A World Without Ice.